If you’ve ever found yourself in need of a transcription service, you know that by doing a Google search, you will see a lot of results. Just because there are many transcription services out there, doesn’t mean that they all match up to each other. Whether your need is for research purposes, work, school, or just a quick service, you’ll want to trust your work in the hands of a top transcription service. Most transcription services will provide you with a minimum accuracy rate. At Scribie, that rate is 99%. You also will find that most companies charge a standard price rate of about $1 per audio minute. Scribie offers a rate of $.90 per audio minute with a 24-36 hour turnaround time. Don’t need it that quickly? Scribie can transcribe your file for $0.75 per audio minute with a 3-5 day turnaround time. Speaking of price, while many of the other top transcription services out there will charge you extra for things like multiple speakers, timestamps, speaker tracking and delivering the file product in Word document form, Scribie does not. Scribie includes all of those things in our prices. Whether your file has one speaker, ten speakers, or more, our transcribers track, transcribe and timestamp without you having to pay an extra fee. Scribie also offers you the ability to keep track of your transcription’s progress. With the unique Transcription Progress Tracking feature, you can follow your file from transcription, to review, into proofreading and finally into the quality check stage. Scribie also offers customers a draft transcript for those who need to get back to work quickly. That isn’t the only feature that is unique to Scribie. The Integrated Editor, which was developed inside of Scribie, is a one of a kind tool that allows you to check your transcript with your audio file. You can click the audio and see the corresponding text or vice versa. Find any blanks in your transcription? The Integrated Editor allows you to find them and fill in any missing information. This free and unique tool allows you to see that the transcription is indeed 99% accurate. As you can see, Scribie offers a lot of various features, unique tools and a one of a kind experience. 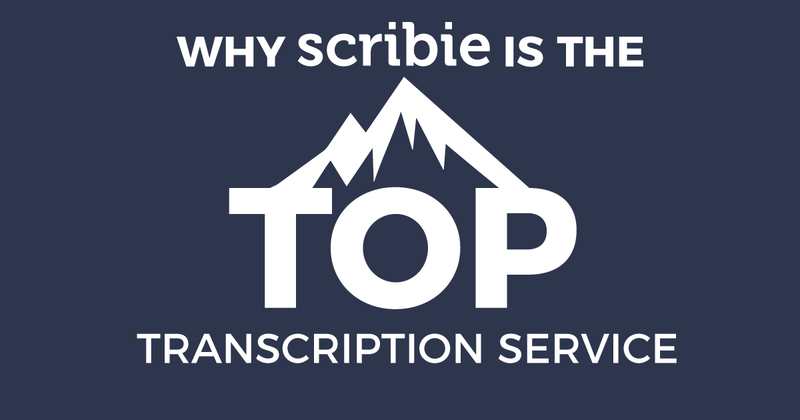 There are a lot of top transcription services out there, but with Scribie, you are getting the best. 99% accuracy at the price of $0.90/min or $0.75/min is really affordable. Thanks, we think so as well!